Orders must be received in the Home Office from noon, CDT, October 1 through noon, CDT, November 1, 2016. Note: Products and colors in packages are predetermined and may vary based on inventory availability. 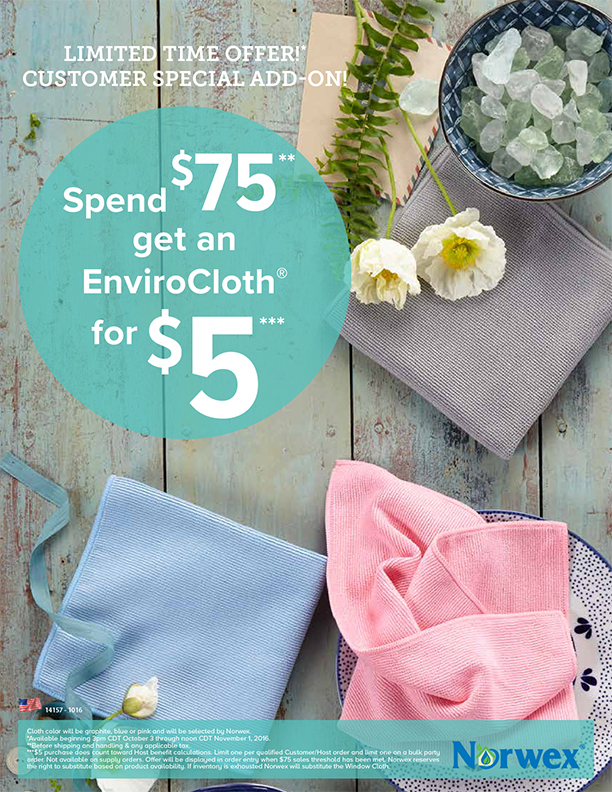 Spend $75** get an EnviroCloth™ for $5***! Cloth color will be graphite, blue or pink and will be selected by Norwex. *Available beginning 3pm CDT October 3 through noon CDT November 1, 2016. **Before shipping and handling & any applicable tax. ***$5 purchase does count toward Host bene t calculations. Limit one per quali ed Customer/Host order and limit one on a bulk party order. Not available on supply orders. O er will be displayed in order entry when $75 sales threshold has been met. Norwex reserves the right to substitute based on product availability. If inventory is exhausted Norwex will substitute the Window Cloth. Earn Up To 25% MORE Host Dollars! 15% (not 12%) of total guests sales in FREE products with sales of $750 and above. Earn More Product with Host Exclusive Offer! 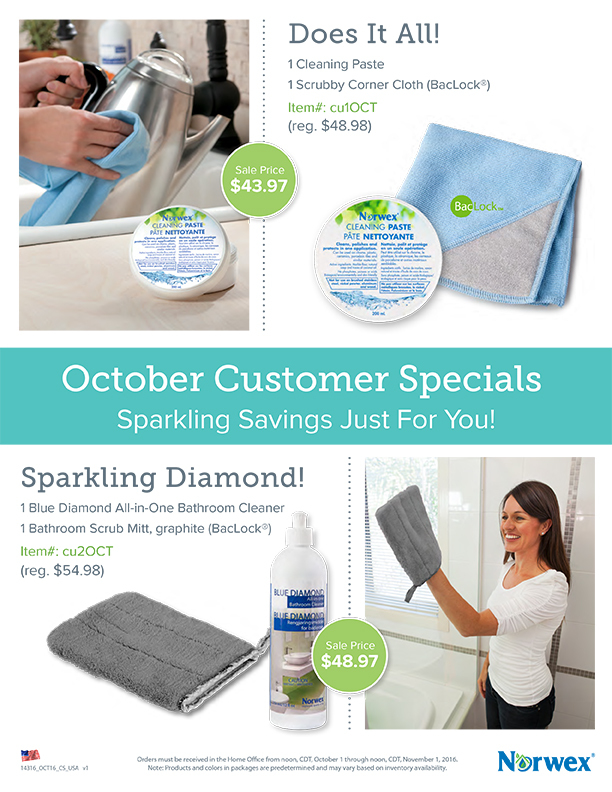 With a minimum $600 in guest sales, 6 buying guest orders and 1 booking, Hosts will receive SpiriSponge (pack of 2), Cleaning Paste and a Bathroom Scrub Mitt in Pink FREE! All parties must be submitted to the Home Office from noon, October 1 through noon, November 1, 2016. Only parties received from 3pm CDT, October 3 through noon, CDT, November 1, 2016 are eligible to receive the limited time Host Dollars offer.